Well, as you can see in my last post I’m officially a new daddy now which means one thing–I’ll probably be reviewing a lot more children’s books. Even if you’re not a parent, if you have nieces, nephews, grandchildren, or friends with young ones, you might want to read these and if there are good books out there, to give them the gift of knowledge and wisdom in addition to the toys and clothes you’re already giving. One hard truth I’ve realized as I’ve become a father is that just in my lifetime we’ve gone from a society that embraced Christianity, to one that was ambivalent about it, to one that tolerated it, to one that is increasingly openly hostile to it (especially in places like where I live in the New York City area). We’re seeing history repeat itself again as Christians outside our country are tortured an murdered for their beliefs, and Christians inside our country are denigrated, despised, and stripped of their livelihoods and their reputations if they dare to come out of their “closet”. And so how do you combat this? The old adage is true–the pen is mightier than the sword. Gutenberg revolutionized the world by publishing the Bible–for the first time in 1500 years people could hold the Word of God in their own hands. And so it is with the children of our society today. And so I’m looking for good books that teach eternal truths, preferably not insulting their intelligence nor beating them over the head with dogma, but letting God’s word speak for itself. And with that, I’ll turn to today’s book. Thank You, Lord, For Everything from the wife and husband writing and illustration team of PJ Lyons and Tim Warnes. I have to say, I loved this book in so many ways. It seems that merchandising of characters has become the only way we can shop for children these days. All you can find are Mickey Mouse blankets, Cookie Monster diapers, Snoopy pillows, Bugs Bunny band aids, and so on. The illustrations in this book by Tim Warnes are the star of the show. The main character of the book isn’t a “star”, he’s just an adorable little bear just going through his daily life of waking up, eating breakfast, playing with friends, and having a picnic. The illustrations are colorful, bright, and as you can see in this example has details that will engage youngsters. The story by PJ Lyons consists of simple and short rhymes where the little bear realizes that he can give thanks for all the wonderful things in his life. What I love about this book is that it teaches 1 Thessalonians 5:18 without even having to cite chapter and verse. It shows this cute little bear living it out, understanding the lesson we grown-ups often forget that everything wonderful in our lives is given to us by God and that with a humble heart we should give thanks, not just mouthing the words when saying grace but by experiencing them in our lives. 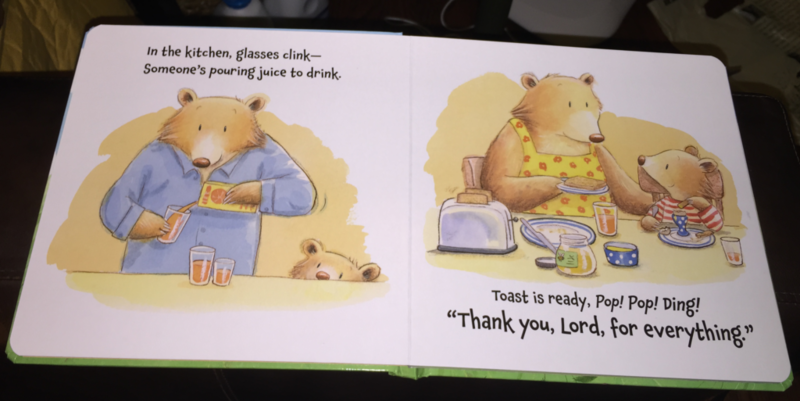 As a father, something else I really appreciate is an appearance from the little bear’s dad, pouring juice for the little guy at breakfast time and spending time to play with him later in the book. It’s sad that the appearance of a good father role model seems to be so rare these days in portrayals of families in media (more often than not, the dad is either bungling or absent altogether), but I was happy to see it here. The hardcover book is solid board book with 16 pages and full color throughout. The cover is thicker, padded stock. While the age range says 4-8 years, I think 8 might be a little too old–it’s definitely a book for much younger children from, say, 3-6–from 3-5 you’re probably going to be reading it to him but by age 5-6, he should start being able to read some things for himself. Sometimes Christian children’s books seem a little like they’re trying too hard to get children’s attention with gimmicks like stickers or attempting to take adult concepts and “dumb them down” for kids. Where I love this book is that it’s simple and tells a wonderful story using natural language and concepts that small kids can understand, with a simple message that will be one of the most powerful for them if they can continue to practice it growing up. This one is very highly recommended, it’s one of the top children’s books I’ve reviewed to date. and one I’ll definitely be sharing with my little one, hopefully over and over again.